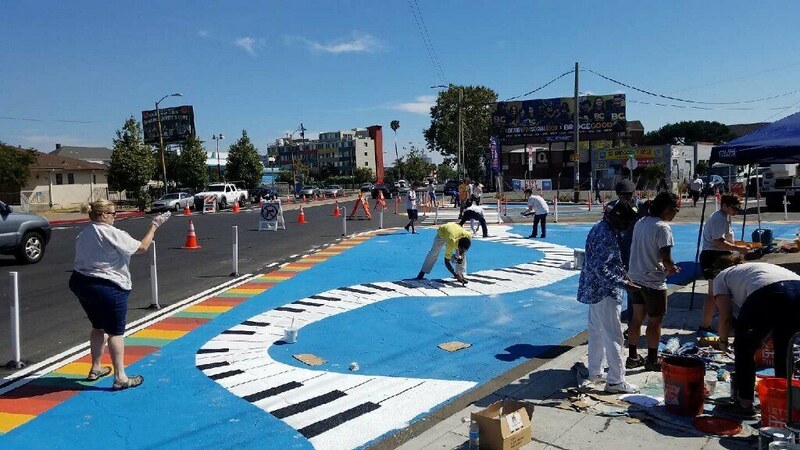 Oakland, CA – Residents painted a new street mural Saturday at the site of a new pedestrian and cyclist safety project near 34th Avenue and Linden Street in West Oakland – the art itself highlighting the rich musical past of West Oakland’s historic California Hotel. Paint the Town is a pilot program launched in 2017 by the Oakland Department of Transportation (OakDOT) to encourage community ownership of public space by facilitating resident-designed, resident-organized mural projects on the pavement. Saturday’s mural project was developed and sponsored by the East Bay Asian Local Development Corporation (EBALDC) as part of the ongoing San Pablo Area Revitalization Collaborative (SPARC). The mural was painted as part of a community event called SPARC-It-Place. The design was proposed by California Hotel residents, an affordable housing development managed by EBALDC, and developed with local artists and through community design charrettes for neighborhood residents. In launching the Paint the Town pilot program, OakDOT sought to minimize historical barriers to community participation in government programs. The department developed a toolkit outlining guidelines, and held application clinics for interested neighborhood and community groups. To encourage equitable service delivery, OakDOT set a goal of approving two projects in underserved communities for every one project approved elsewhere, and exceeded that goal significantly. The department ultimately selected 30 mural projects to facilitate in the first round of the pilot. This mural will be the sixth completed project since the program started implementation in May 2018. All projects received some financial support from the independent Oakland Fund for Public Innovation for supplies, and seven projects were granted full support by the Fund, including the EBALDC project.